A loss and a draw for United has cost them a place in the East, dropping to third behind Columbus (33 points) and Chicago (32 points). 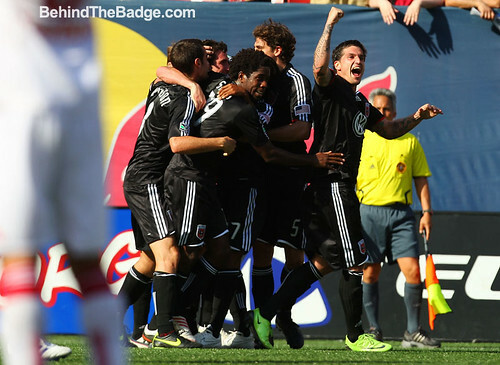 Another draw in the CONCACAF Champions League against L.A. Firpo has brought us a rough patch for the squad. Houston put the screws to United this past Saturday in the high-scoring 4-3 match, despite nearly blowing a 3-goal lead. What’s next for United? Get out your passports. Tuesday is a CONCACAF rematch against L.A. Firpo, but this time in El Salvador, and then a trip to Toronto next weekend for a run against Toronto F.C. Then, finally, look forward to the return of the LA Galaxy on the 22nd. When a .500 run is a major improvement, your season is in pretty lousy shape. But, this has been a good stretch for the Nationals, both in offense and pitching. Even the defense has had a pretty good stretch. Since last we spoke, the Nats have won a series against the Mets, won a series against San Diego, split four games evenly with Milwaukee, and if they win tonight, they’ll split four games with Pittsburgh. That’s not so shabby for a team so deep in the sub basement, the cellar doors look like postage stamps. The Nats come home Tuesday for a brief homestand against the Marlins, and former Nat Nick Johnson, and the Diamondbacks of Arizona. While the Nats’ season has been pretty much terrible, it’s hard to see them competing for the worst record ever, much to the relief of the fans. Riggleman’s been showing some passion on the bench, getting bounced from one game (the first managerial ejection all sesason) and putting on a good show for the fans a few other times. The remaining wildcard for the Nats this year is Stephen Strasburg. Will the Nats pony up tens of millions for this prospect? Or will they pass on him and force him back into the draft for another year? I don’t think the Nats can pass and maintain the appearance of caring about the ballclub’s future. It’s a lot of money, but rejecting Boras and Strasburg would be a critical mistake. It’s amazing what two weeks of .500 play can do. The Mystics six games, and moved up in the standards to tied with second place Connecticut. Indiana Fever continue to have the Mystics number, though, as all three of the losses came at their hands. 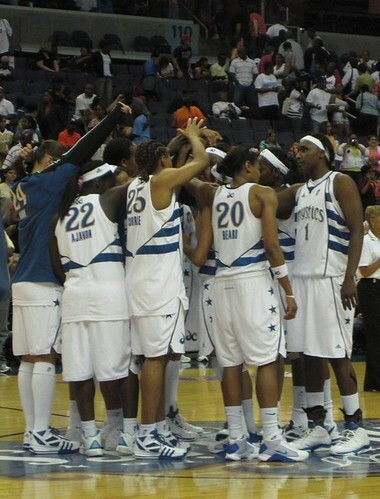 Alana Beard, Lindsey Harding and Crystal Langhorne, though, they made short work of Chicago, Sacramento and New York. Langhorne is first in the league in shooting from the field and third in the league for boards, and Lindsey Harding is fourth for Assists, while Alana Beard is third for steals and sixth for points scored. There are just sixteen games left in the WNBA season, which means each game means more and more. The Mystics play at home Friday and next Tuesday against Detroit, and then welcome league leader Connecticut to the Phone Booth next Friday. Tickets are available for all three games, get down to the booth!